Right, where do I Start? I’ve said this before but One thing I like to do when I’m popping a wedding together for you lovely folk is to reach for the headphones and ‘spotify’ the first dance song. It helps me get a vibe for the day whilst I’m selecting the images I’m going to use and more importantly I get a feel for the newly weds as people. When it’s a song I love, so much the better. I’m a big David Bowie fan but I would never have thought of Absolute beginners as a first dance song, yet it’s perfect. That mix of drama, big sound, flamboyence and genius Bowie lyrics. It’s an “all out” love song that is steeped with sincerity, without the slightest hint of cheese. 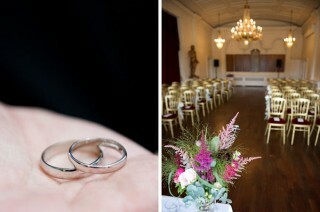 Ok, next thing – this wedding is immense! I love Emilia and Christian’s style. Emilia didn’t want to be too classically “bridey” and she achieves that look perfectly. She wanted to do the “Jack Rabbit Slim” dance with her dad (with shoes off and everything) so she did that too. These guys did exactly what they wanted and it just worked. I feel as if they could have decided on something really crazy like, I dunno “Let’s have a stuffed crocodile head on the top table…” and they’d manage to pull it off… But that would be madness right? 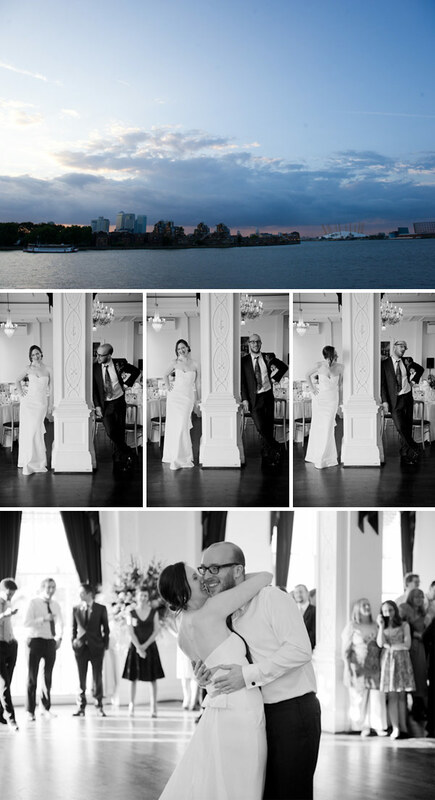 We were married on July 9th, 2011 at the Trafalgar Tavern in Greenwich. I went home to the US to see family just after we got engaged and my Mom strong-armed me into going dress shopping with her. I was never very girly and actually don’t really like wedding dresses that much, so I was not optimistic at all about finding anything that I liked. We went to a couple of shops and I have to say that on the whole I hated all the dresses that I saw. I wanted something that didn’t scream ‘wedding dress’ and more like a red carpet gown; sleek with a unique twist to it. The dress was the final one that was brought out to me and at first glance I wasn’t that blown over by it; however once I tried it on I knew that it was the one. I knew I wanted a strapless dress and I thought the back was so different than any of the other dresses that I had seen. It is a Nicole Miller dress and it was from Bridal Garden in New Jersey, US. I didn’t want a veil or tiara – again trying to look as least bridal as possible. I decided on a vintage style, crystal hair comb from etsy that added sparkle for some glamour. I love love love big statement earrings and like the look of having one piece of jewellery really stand out. I always stopped to drool at the jewellery in the window of Hirst Antiques, in Notting Hill and I knew they would have a pair of earrings that would be perfect. The ones I chose are a pair of 1940’s Czechoslovakian cut crystal earrings. I thought the amber crystal colour was so beautiful. I liked the idea of not wearing white shoes-when would you wear those again anyway? So I went for a pair of Ted Baker, peep toe, royal blue, and 3.5 inch heels. They had a black structural bow on the toe that complimented the bows on the back of my dress. Alexis Daly did my make-up and hair. She was recommended by my photographer and she was so incredibly great. I told her that I wanted to look like me, i.e. natural, but more enhanced and she completely understood what I wanted. She did a pretty, twisted side knot for my hair. She was also totally great on the day and made everything relaxed and fun while we were getting ready. I really love black dahlias and black calla lilies. I wanted a wild, Victorian garden, Gothic vibe to the flowers. I also love mixing textures and foliage with flowers. Rachel Morgan did the flowers and they were even more beautiful than I expected. She added unripe blackberries and wild meadow flowers to the mix that worked perfectly. We didn’t have a colour scheme or a theme because our bridesmaids and groomsmen were just my sister and Christian’s brother. We wanted them to feel comfortable in what they were wearing so we let them wear what they wanted-with our input of course! Christian bought his brother a Liberty tie and pocket square, along with black Barbour cufflinks. So I guess there was a slight British theme! Christian had a bespoke suit made by Max Hence in Spitalfields. It fit him so perfectly and it had wonderful details like turn-ups on the trousers. His shoes were Loake oxblood brogues, and he let me pick out his tie from Liberty. I chose one with rich burgundy colours that would complement the black calla lily he wore for his buttonhole. Amy Murrell from Especially Amy was our photographer and we made our decision to choose her based on some of her other work that we had seen. We knew we wanted a more documentary style to our photographs and Amy’s photographs were exactly that. 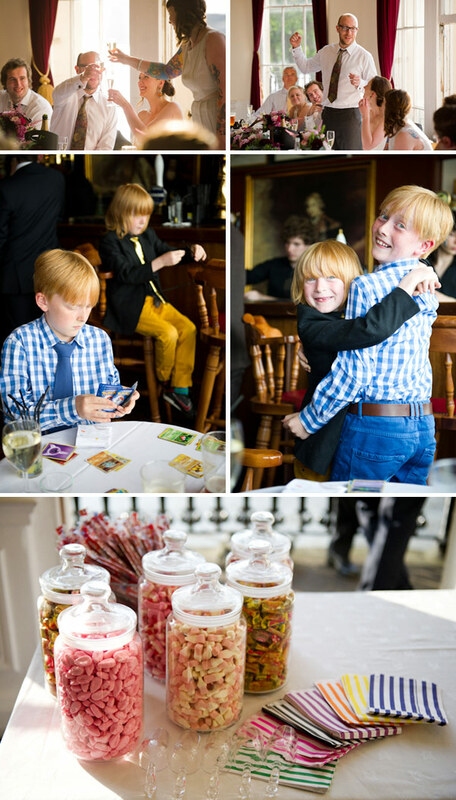 She was able to capture so many special moments between our friends and family. And even though we hate to pose for photographs, Amy made that totally bearable and some of them turned out to be the best ones! We knew we didn’t want a traditional wedding cake because we both don’t like fruit cake and at every wedding we have been to, the cake is always left in the corner and no one eats it. We toyed with the idea of cutting it during the wedding breakfast and serving it for our desert course but that didn’t really work with our caterers. Christian was doing some research on types of cakes and he came across the Croquembouche, a traditional French wedding cake. It is a tower of choux buns filled with different types of flavoured cream fillings and then held together with spun sugar. We went to go taste some at the patisserie, Boulangerie Jade in Blackheath and were hooked. We couldn’t decide on one filling so we convinced them to include all the flavours and to mix them up so that each bun would be a surprise. The flavours were vanilla, chocolate, raspberry, rum, whiskey, cognac, and Armagnac. This way guest could take small buns off the tower themselves throughout the evening to keep them going! We love music and didn’t want to hand over control to a DJ so we did our own ipod playlists. It was great because we got to hear all our favourite songs without any duds in-between. We danced to Absolute beginners from David Bowie. Bowie is a fav of ours and we had a particularly fun evening early in our relationship that included lots of wine and listening to this song in my garden. I also had a Father/daughter dance with my Dad. It is a tradition for weddings in the US, and being American I couldn’t pass it up. My Dad and I did the Jack Rabbit Slims twist contest dance from the movie Pulp Fiction. We even took our shoes off before the dance like in the movie. When I was 15 he took me to see it in the theatres and it has been a favourite movie of mine ever since. We had an arrangement of sweets for the guests. Half were old-style sweets from the US like Mary Jane, Bit o’ Honey, and Squirrel Nut Zippers and the other half were English gummies like foam shrimps. The space at the venue was so beautiful and grand that we really didn’t want to detract from the architectural features of the room. One whole wall was windows and a balcony that overlooked the Thames and we felt it was stunning enough and didn’t need dressing up. We did have a little nod to where we met though. We met while working at a museum with a natural history collection so we decided to have a few bell jars with antlers, fossils, etc..that was reminiscent of a Victorian cabinet of curiosities. We also had a taxidermy crocodile head and a deer skull mixed into the top table flowers. It was so wonderful to me that my family and friends could make it over from the US for my wedding and that really made the wedding the best it could be. The advice I would give to other brides is something that Alexis, my hair and makeup stylist told me while she was getting me ready. She said to make sure that you get a chance to spend some private time with your husband because the whole day will be a blur of activity and you will find that people will be lining up to talk to you. You don’t want to get to the end of the evening and realise that you barely saw your husband! I followed her advice and it really made all the difference for the day-thank you Alexis!